Customer Success Story - Singletrack Health, P.C. Full-scope family medicine, procedures, vaccinations, physicals, and low-risk OB/GYN services through a partnership with UP Health System Marquette. Dr. Christopher Dehlin and Dr. Jennifer Dehlin launched Singletrack Health in May 2016, with the goal of focusing on continuous improvement in order to provide the highest quality family medicine to their community. With deep roots in Michigan’s Upper Peninsula, each felt that they had the knowledge, experience, and perspective necessary to achieve both autonomy and excellence. The Dehlins went with the eClinicalWorks EHR/PM solution from the beginning, believing it was the best fit for the vision they had for their small practice. The first 18 months since Go-Live have confirmed their decision, but the Dehlins and their staff have been impressed by how useful it is to have a truly integrated healthcare IT solution, as well as surprised by the usefulness of key features, including eClinicalMobile and the ID card scanner. The eClinicalWorks EHR has improved the efficiency of Singletrack’s office. Front-office staff report faster workflows, providers are enjoying the flexibility that eClinicalMobile provides for documenting cases, and Singletrack is saving time through effective use of the inventory management tools. Some 67% of Singletrack’s patients are using Patient Portal for communications, lab results, and education. With the practice running smoothly, the Dehlins are also able to reach out to the community with health-related events and sponsorships. 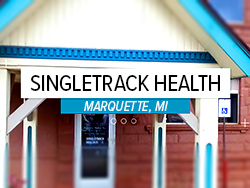 Founded in May 2016, Singletrack Health is a small, family practice clinic serving patients in and around Marquette in Michigan’s Upper Peninsula, on the shores of Lake Superior. Dr. Christopher Dehlin and Dr. Jennifer Dehlin, husband and wife, set out to create and maintain a small practice that emphasizes continuous quality improvement. With eClinicalWorks helping them achieve their clinical goals, the Dehlins have been able to maintain their autonomy, while remaining highly involved in health-related activities in their community, including sponsoring sports teams and fitness runs and other events.